The most commonly used words and expressions used in Wills and Trust are listed below. Administrator (m) /Administratrix (f): The name given to a personal representative if not appointed by a valid Will. This person obtains a grant of letters of administration from the Probate Registry to show that he or she is the person with legal authority to deal with the deceased’s estate. Advised: Will. Will service where you are given advice and assistance in writing your Will. Assets: A person’s land, buildings, investments, savings and personal chattels which together make up their estate. Attorney: is a trusted person who will make decisions on behalf of Donor. If you have only named one best practice is to have a replacement named should your first choice be unavalible. Beneficiary:A person who benefits from the will (cannot be a witness) but can be Executor. Bequest: A gift of a particular object or cash (as opposed to ‘Devise’, which means land or buildings). Bonded Will: Leaving a Will that has not been bonded, leaves it open to being altered. If you have simply stapled pages of your Will together at some point in the future a page could be replaced, this could be by a member of your family you have not yet met i.e. A future in-law. 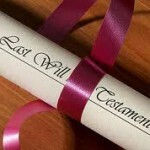 You would not leave a blank signed cheque around remember your Will is the key to your estate. Business Will. If you run a business even as a sole trader your executors do not have automating rights to administer your business even as a sole trader executors need to sell the business and assets, appointing business executors makes this process much simpler. Charity: An organisation registered with the Charity Commission as it meets the legal definition of a charity. E.g. Hospices. Certificate Provider: (re Power of Attorney) Must have known for two years unless a professional i.e. GP or Solicitor. Civil Partner: A person who has entered into a civil partnership with another person. Civil Partnership: The relationship between two civil partners registered under the Civil Partnership Act 2004. Child (referred to in a Will or Intestacy): Child of the deceased including adopted and illegitimate children but, unless specifically included in a Will, not stepchildren. A child is aged under 18. Children’s Trust: Without a Children’s Trust the inheritance is at 18, this can mean that they have FULL control over ALL the assets left to them. Not only is this possibly placing them in a position of responsibility that they cannot manage, but could also put them at risk from the less desirable elements of society. A Children’s Trust is an additional part of the Will that appoints the executors to act as Trustees until the child has reached a specified age between 18 to 25. This does not mean they have no access, but expenditure is controlled by the Trustees, in line with your wishes. Typically funds can be used for Education, Health, deposit for a property, purchase a car, or any reason the trustees consider reasonable and in line with your wishes. Class of persons: A group of people with a particular common link, e.g. all my grandchildren, or all my first cousins. Codicil: A document that alters an existing Will. Co-habitee: The term ‘common law wife’ has no legal force. Complex Family: A complex family is any family group where all the children are not the JOINT children of both parties or where there are step parents / children. Any family group where one or more parties may not inherit if the “Rules of intestate” were applied. Depriviation: To deprive the estate of assets i.e. to give assets away for no return. Transferring a property or asset into a relatives name is usually Depriviation. Disabled Child Trust Will: This is similar to a standard child’s trust but continues for the life of the child and also deals with passing the disabled child’s assets on to beneficiaries. Domicile: The country you consider to be your permanent home for tax purposes, even if you actually reside elsewhere. It is distinct from nationality and place of residence. En Ventre Sa Mere: This means literally a child within the Mother’s womb i.e., an unborn child. i.e. conceived but unborn at time of death inherit . Estate: For inheritance tax purposes since 22 March 2006, this includes a person’s assets in their sole name, their share of joint assets, assets they have nominated elsewhere, assets in trust (an immediate post death interest, disabled person’s interest from which they had a benefit) assets given away but in respect of which a benefit had been reserved and the value of chargeable transfers within seven years of death. Excepted estate: One that is less than £325,000 or more than £325,000 but less than £1,000,000 and no Inheritance Tax is payable because the estate passes to a spouse, civil partner or a charity. Executor(m)/Executrix(f): The name given to a personal representative if he or she is appointed by a valid Will or codicil. The executor will have to apply for probate of the Will if it comprises stocks and shares or invested money over £15,000. When you appoint an executor, consider whether it is necessary to appoint a professional executor such as a solicitor, will writer or bank. A professional executor is rarely needed if your affairs are straightforward – it can be done by family or friends including beneficiaries. Even if there is no professional executor named in the Will, a non-professional executor can still employ a professional when you die if they wish. Whether a firm is named as sole executor, or joint executor with a non-professional, the firm’s fees will be payable unless they “renounce” (give up) their executor duties. It can be expensive to use a professional executor particularly if they charge a percentage of the value of the estate. Professional executors do not have to renounce if they are asked to by the beneficiaries and may say they have been appointed according to your wishes when you made your will. Free of Tax: Gifts made by a Will can be expressed to be free of tax which means that any inheritance tax on the value of that gift is borne by the residuary estate. Grant of probate: The document issued by the probate registry to the Executors of a Will to authorise them to administer the estate of someone who has died. Guardian: A person who would become responsible for your children in the event of your death before your children are 18 years old. Inheritance tax (IHT): The tax payable when the total estate of the deceased person exceeds a set threshold (subject to various exemptions, reliefs and adjustments). Issue: Your children and all generations arising from them – grandchildren, great-grandchildren, and so on. Legacy: A gift of money or object. Letters of administration: The document issued by the probate registry to the administrator of the estate of an intestate person. Letters of administration with Will annexed: The document issued by the probate registry to the administrator when there is a Will but the Will does not contain a valid appointment of an executor. Mirror Will is Two Wills that are the same apart from the names. The distribution is the same for both parties. Notified Person (re Power of Attorney) can raise an objection better to be independent of family. Office of Public Guardian: Office of the public guardian acts if there are no Guardians in place. Court of Protection: acts if no Power of Attorney in place. Partial Intestacy; First level of distribution is ok, but if first beneficiary predeceases and no reserve beneficiary is in place the Will reverts to Law of Intestacy. Per Stirpes (Par Starpiz) follows blood line i.e. if child predeceases then it goes to grandchild. Pre-Marriage Clause. Marriage voids an existing Will unless a pre-marriage clause is added. This enables the Will to be valid after the marriage. Time limits can also be placed i.e. the Will is only valid if a marriage takes place within a set time. Probate of the will: The document issued to executors by a probate registry in England, Wales and Northern Ireland to authorise them to administer the estate. Probate Registry: The Court that deals with probate matters. The Principal Probate Registry is in London with district registries in cities and some large towns. Property Protection Trust Will: A trust built in to a Will that can give a right to reside to one person but ownership to another. Typically used where you want your second wife to be able to live in a property but the ownership is to your children. Residuary beneficiary: A person who gets or shares what is left of the estate after all debts, taxes and specific legacies have been paid. Solvent: Value of the assets exceeds any debts and liabilities. Specific bequests: Particular items gifted by Will. They may be referred to as ‘specific legacies’. Rules of Intestate: When a person dies without leaving a valid will, their property (the estate) must be shared out according to certain rules. These are called the rules of intestacy. A person who dies without leaving a Will is called an intestate person. These rules do not take in to account anything other than the bloodline. Example if a person died leaving a son and daughter where the deceased daughter had been her carer for 20 years and the deceased son who she had not seen or spoken to for 40 years would both receive an equal share. Single Will: A Will just for one person. it does not mean that the person is not married. Settlor: Person placing their assets in to the trust. Tenants in Common: Where two or more people own assets as “Tenants in Common” it means that they each own a share of the property and on the death of any of them the deceased’s share passes in accordance with their Will or under the rules of intestacy if there is no Will. See Joint Tenants. Testator(m)/Testatrix(f): A person who makes a Will. Trustee: A person responsible for administering a trust. Will: The Legal document witnessed by two witnesses in which you say what is to happen to your possessions on your death. .. …. .. .. .. ..